AT&T just announced pricing and availability for the rugged Samsung Galaxy S4 Active. Beginning next Friday, June 21, the toughie will be present at any AT&T store or online for $199.99 when you sing off on a two-year contract. Those of you who can't wait can preorder the S4 Active in two colors - Urban Gray and Dive Blue - starting tomorrow on the carrier's website. As a reminder, the Full HD 5-incher is IP67 certified to be water-resistant and dustproof, which is tested in the video below. 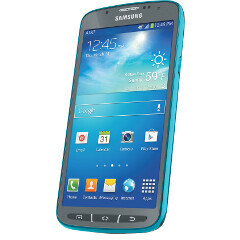 come on T-mobile bring this phone... to papa lol but l mean it !!!! Why only AT&T? Come on, Verizon, you love rugged phones too. I might even consider the S4 Active. I think this phone is better than the s4. The only downgrade is the 13 megapixels. 13 megapixels isn't really a downgrade for such a small sensor. 13mp is probably too much for a point and shoot sized sensor to be honest. I was shocked to find that the 8mp version of the new EXMOR RS sensor in the Xperia SP performed worse though. I thought the SP was going to take better pictures than the Xperia Z and GS4 because the 8mp version would have less noise. Let's see what Samsung firmware/software can do with the same sensor. Samsung is generally pretty good with camera firmware/software so I predict the 8mp GS4 active camera will outperform the GS4, provided it uses the new EXMOR RS sensor line. 13mp is too high unless they make a larger sensor and 4mp is just a joke. 8mp is the sweet spot for mobile phone sensors imo.